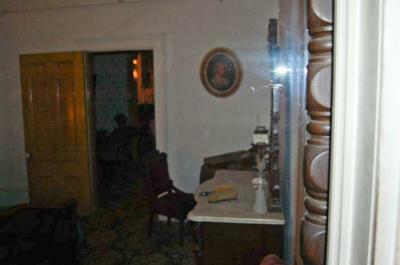 My friend Kenny, Jesus and I recently visited the Whaley House Museum on 06/17/2010. When my friend Jesus reviewed what pictures he took, he found a Shadowy Figure which looks as if its back is turned to us, staring down at something. It appears as if it was looking down at a crib or something but my friend Kenny said he thought it is just sitting down. It is a very interesting picture! Omg I totally see the shadow - it's a man that looks like its back is towards you. it looks like a black silhouette... interesting! im sorry but I cant see the ghost?! The original file is 1.81 MB big and the upload tool will not take anything over 1 MB. Is there by chance another email I can send this to? I fear in shrinking it, may distort the image. I only received one version. Please upload the 2nd one independently. Also, could you please circle the area in question? Sometimes, there is a change of resolution once uploaded, which makes the images murky. I'm not totally sure I see what you're talking about.